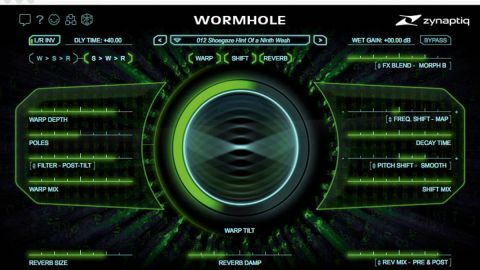 A sound design monster for both music and post production, Wormhole does things to your signals that can’t be done with any other plugin. Exceptional frequency and pitch shifting. Zynaptiq’s new multi-effect plugin (VST/AU/ AAX/RTAS) is being marketed largely on the basis of its ability to elicit otherworldly textures and tones from source material of all kinds - alien and robot voices, sci-fi ambiences and soundscapes... you know the deal. More importantly, though, it turns out pure music production is also firmly on the agenda. Wormhole comprises three main sections, each with its own dry/wet Mix control - Warp, Shift and Reverb - and a final FX Blend stage for melding (as opposed to simply mixing, although that’s available, too) the dry and wet outputs. The positioning of the Warp and Shift sections in the chain is swappable, and the Reverb is activated pre and/or post FX Blend. The Warp section messes with the frequency content of the signal to produce ring modulation-, pitch/frequency shifter- and resonator-style effects. The range of frequencies affected and their relationship to the original pitch are defined by the Warp Depth slider, and output frequency variation range is governed by the Poles slider - crank it up for a robotic monotone. The big trackball in the middle is really a prettified fader that controls the Warp Tilt parameter, which works rather like a combination pitch and formant shifter, transposing the sound and changing its overall character. Warp Tilt can be preceded or followed by a low-pass filter - in Pre mode, this introduces unexpected (but by-design) imperfections and aliasing. Rather than the usual FFT or resynthesis techniques, the Warp section instead uses “proprietary time-domain local spectrum inversion”, which Zynaptiq say keeps the output free of pitchy artefacts. We can confirm that it is indeed a very smooth effect; bending, skewing and shifting the frequency spectrum without negatively impacting on solidity and cohesion. The Shift section contains both pitch and frequency shifters, the first with four octaves of range up and down, the second travelling up to 4kHz either way, and each applied independently. The Frequency Shift slider can be set to progress linearly or exponentially, and four Pitch Shift modes are on offer: Smooth and Tight, suited to sustained and transient-heavy sources respectively, and a pair of corresponding Detune modes, shifting the left and right channels up to +/-48 cents in opposite directions for wonderfully solid chorus-style thickening. The Decay parameter applies an amplitude envelope to the shifters. Again, the Shift section eschews the standard FFT-and delay-based approaches in favour of proprietary time-domain-based algorithms - the Pitch shifter, for example, takes hold of specific partials with hundreds of frequency shifters, effectively eliminating sidebands and aliasing. And again, the results bear this out: the character of the shifting is unlike any we’ve heard before, and having separate control over pitch and frequency opens up all manner of creative spectrum and pitch manipulation possibilities. As Wormhole’s final output mix control, FX Blend is a key part of the processing chain, with its Morph A and B modes providing two variations on the Classic algorithm from Zynaptiq’s acclaimed Morph 2 plugin. case with a ‘normal’ mix control. Morph A bases the ‘interpolated’ sounds in between the dry and wet extremes of the FX Blend slider on the wet signal, while Morph B uses the dry signal as its transitional foundation. The difference - depending on the state of the other parameters, obviously - is that Morph B generally sounds less heavily processed than Morph A. The Warp, Shift and Reverb sections each include dry/wet mix controls of their own, and the ability to morph the whole lot at the end is brilliantly effective, having a massive influence on the end result. Of course, when you do want to blend your dry and wet audio streams in conventional earthly fashion, FX Blend’s third mode, X-Fade, has you covered. At the end of the chain, Wormhole’s dual (pre and post FX Blend) Reverb module packs the same hall algorithm used in Adaptiverb’s Allpass mode. Its three parameters - Size, Damp and Mix - control both the pre and post instances, but the random tail modulation is generated separately for each, so when running in ‘Both’ mode (using the pre reverb in conjunction with the FX Blend Morph modes for sound design, followed by the post reverb for spatial ambience), you’re not just running through the exact same reverb twice. Finally, at the top left of the interface are buttons for switching the order of the Shift and Warp modules, and a spinner for applying up to +/-500ms of delay prior to all other processing: positive values delaying the wet signal, negative values delaying the dry signal so that the processed sound arrives first. Hitting the L/R Invert button inverts the Delay Time for the right channel (negative becomes positive and vice versa) for instant widening. Although short single echoes are within its sphere of operation, Wormhole’s delay is intended as a sound design feature, to be exploited via the FX Blend Morph modes, under the governance of which it becomes a sort of dynamic-shaping tool. Although Zynaptiq seems to be selling Wormhole mostly on its wacky sci-fi sound design credentials, bonkers voice transformation and out-there FX are only two of its talents. This is a dazzlingly productive plugin for music production of all kinds, serving up everything from luscious harmonising, tonal polishing and frequency smearing to ‘metalising’, rhythmic reconstruction, colourful spatial expansion and much more - all with a more than vaguely ‘Eventide’ vibe. Vocals, guitars, pads and other frequency-rich melodic sources are the most obvious targets, but we had an absolute blast throwing beats and percussion at it, too. On the down side, although a comprehensive MIDI learn system is in place, we’re dismayed by the absence of modulation - a couple of LFOs or step sequencers for getting those Shift and Warp controls moving would be more than welcome. We’d also like to be able to adjust the two reverbs independently of each other. Those moderately sizeable omissions aside, though, Wormhole is a winner: easy to use, sonically stunning and full of spectral surprises.